Welcome to the Plumstead History Books page of FamLoc. To help with building a knowledge of the local history of particular towns, we have included pages especially dedicated to displaying the available local history books. Indeed, here at FamLoc, we are in the process of editing out of print local history books and republishing them, so making them available to all, wherever in the world you might be. 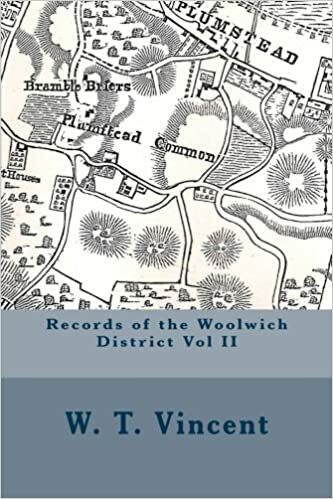 There doesn’t appear to be any specific Plumstead history books, but certainly Records of the Woolwich District, volume II, originally published in 1890 and recently republished by FamLoc, contains a great deal of information on Plumstead local history. This was originally published in 1890, and covers Abbey Wood, Bexley, Charlton, Eltham, Erith, Kidbrook, North Woolwich, Plumstead, Shooters Hill, Welling, and Wickham, as well as additional topics on Woolwich. It includes over 200 illustrations, plus 45 photographic portraits of local men of influence. The book includes many old maps, is rich in the main institutions of churches, schools, charities and industries, and also includes topography, and notable events, making it invaluable for the local historian, family historian, and others with connections to the area around Woolwich. This FamLoc edition is a slight modification: there have been changes to format and punctuation. However, the grammar and prose has been faithfully retained, other than changes to a handful of typographical errors and the very few instances where clarity was required. Near the Warren gate (1) stood Burrage House, not shown here. That it existed is beyond all question, but Queen’s College in this sketch ignores most of its neighbours. The land of Sir John Conyers was added to the Warren about the middle of last century. The house on the north side of Plumstead Road occupies the position of the storekeeper’s residence. It may have been the residence of Sir John Conyers. The long road marked (2) is now called Vicarage Road, and has borne the names of Deadman’s Lane and Brambleberry Lane. At (3) is the head of Griffin Manorway. Here is now Plumstead Railway Station. I can find no trace or remembrance now of either The Hare or the Almshouses. Water Lane (4) is now Cage Lane. A brook from Plumstead Common Slade ran across the high road. The plan at this spot is a little obscure, owing to a crease, and I can only conjecture that three houses or the Three Horses Inn stood here. At the foot of Skittles Lane (5) is now the White Hart Estate. The White Hart, a tavern, was burnt down about eighty years ago. The Vicarage is now the Volunteer Inn. The roads at Cage Lane and Skittles Lane were as we find them to-day. At (8) is the Slade, with the branch roads, King’s Highway and Timbercroft Lane, diverging therefrom. King’s Highway (9) is unchanged. The indistinct road (10), now obsolete, has left remains near Woolwich Cemetery. Swingate Lane (11), extending to Wickham, is now nearly extinct. The Glebeland is the site of Speranza Street. The Feathers Tavern is still extant. Hog-trough Lane is now a footpath through land called “Little Bartletts.” The old name would be appropriate still. The Old Manor House is shown in Wickham Lane. “Boston Common” is a palpable error. The place was known as “Borstal” many generations before this map was drawn. Stroud Green (12) is now known as “Shoulder-of-Mutton Green. ”The Catherine Wheel” at Shooters’ Hill is lost in the gloom of the past. The house opposite was probably a mansion, and afterwards became the Bull Hotel. Plum Lane and Shrewsbury Lane (13), which undoubtedly constituted an old thoroughfare, do not appear upon the map. The figure (6) marks the stream which bounds Plumstead at Brook Hill Road and (7) Woolwich Common. And the third has both in fee. At any rate, Plumstead was rich with orchards down to our own time, and it is an established fact that here the cherry was first acclimatised in England. It is also recorded that when “the pippin was brought from over the sea” in the sixteenth century, the delicious apple was first grown in Plumstead. The names of Orchard Road and Plum Lane survive in evidence of their origin, and the part of Plumstead Road for some distance below Burrage Road was known as Orchard Place long after the houses were built; the orchard behind it remained until after 1850. The Rev. J. K. Walpole, who wrote a pamphlet while curate here, suggests a better origin than the fruity one. Here probably lived, he says, the people who collected from the wild geese and herons of the marshes the plumes to ornament the dames and gallants of the court, and quills for the scriptoria of the monasteries. It is to be noted that there is a tavern called The Plume of Feathers near the marsh, and this house bore the same name in 1720. The parish, therefore, may have been named the Plume-place or Plumestead. “In following the advancement of this parish the only figures on which we can base an estimate prior to the first census in 1801 are the registers of the baptisms and burials, and these are even less reliable than usual, in consequence of the large extent to which Plumstead Old Church and churchyard were resorted to by residents at Woolwich. However, they may be taken at a discount value. We include other books of interest, as well as the excellent Godfrey maps of Plumstead. We are always looking for more Plumstead history books, and welcome your suggestions.